It’s the perfect time of year to enjoy the warm days and long summer nights. If you’re arranging an office summer party, try these corporate event ideas to make it an affair to remember. Summertime is best spent outdoors and what better way to let your hair down with colleagues than at an open air festival or concert? Make a weekend of it with some corporate glamping, or simply enjoy a picnic under the stars accompanied by a play, opera or concert. Everyone loves a barbie! 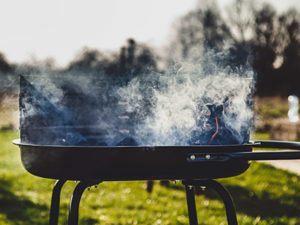 If you’re after easy-to-arrange summer party ideas, a barbecue is always a winner, and it’s a great, informal way to move from afternoon to evening and let people join in when they can. To bring people together (and delegate some of the work), get everyone to bring a dish. Don’t forget to organise separate equipment for meat eaters and veggies. At the other end of the scale, a glamorous cocktail party is a great way to treat your hardworking staff, as well as entertaining your corporate clients. Make everyone feel like a million dollars; roll out the red carpet for a Hollywood-themed event or throw an elegant masked ball. For a team-building exercise before the big night, arrange a cocktail-mixing course for your co-workers. For something a bit different from the usual corporate golf day, why not try croquet? A quintessential summer activity, it’ll get everyone outside and loosen them up. You can also incorporate an element of competition, with prizes for the tournament winners. There’s nothing more satisfying than the reward of a full basket of fruit you’ve harvested yourself. Head to your nearest pick-your-own farm for an afternoon of strawberry picking – then enjoy the spoils with a glass of champagne for all. Working in an office or other indoor environment, it’s tempting to stay in your comfort zone. But getting outside into the fresh air can help energise us all. Organise a team hike to gently challenge your colleagues, then grab a well-earned dinner and drinks in a pub at the end of your route. If you’re desperate for ways to keep cool in the summer, put your team to work! Water guns might work well as an alternative to paintballing or you could organise an ice sculpting workshop. Whatever you choose, your colleagues will be glad to beat the heat with your chosen summer activity. Who doesn’t look back fondly on school coach trips to far-flung places? Recreate the experience with a grown-up field trip. You could visit a local place of interest, or simply head up the motorway to your nearest theme park. Whatever the activity, you’ll find new ways to bond as you travel together to your destination. Want to party all night long? Hold your corporate summer party in a nightclub! Get the glowsticks out, dress up for a night on the tiles and use a photo booth to make sure everyone comes away with happy memories. Say cheese!